The Southeast Asia Makerspace Network (SEAMNET) is a network of makerspaces within ASEAN, working together towards a common mission to advocate and develop the Maker movement in their respective localities. 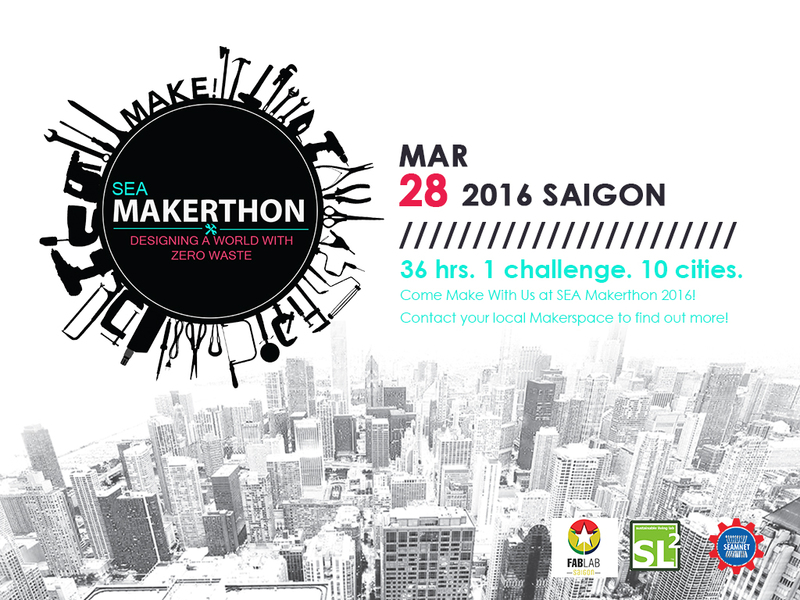 The SEA Makerthon 2016 sees 1000+ makers from 6 countries come together to innovate for social good. This year’s theme, “Designing A World With Zero Waste,” challenges talented makers, designers, and entrepreneurs in 10 cities in Southeast Asia to create innovative solutions for local sustainability issues in their own cities. Winning teams will be part of the Apprenticeship Program. Local makerspaces will assist them in refining their idea for the Grand Finale at InnovASEAN (Asian Makerspace Summit) in Singapore this October. On a sunny Sunday afternoon in Ho Chi Minh City, there was a buzz of activity and excitement. The Fabmasters of Fablab Saigon were converting a classroom into a mobile makerspace, decking it out in 3D printers, a laser cutter, an antique sewing machine, and a variety of woodworking tools. While the equipment was your usual makerspace fare, the natural materials provided — coconuts, banana leaves, bamboo leaves, and hay — are not typical material found in such spaces. Groups of young Vietnamese were busy experimenting with traditional material and combining them with digital fabrication techniques to create products and business models that produce no waste by intention or design. These young Vietnamese students and adults were participants in the first ever regional makerthon organized by the Southeast Asian Makerspace Network (SEAMNET) and 10 makerspaces and fab labs. Makerspaces are zones of self-directed learning. Their hands-on character, coupled with access to state-of-the-art digital tools (i.e. 3D Printers, Laser Machines, CNC Machines) and raw materials help support the development of innovative ideas. Such spaces provide an avenue for deep and creative interaction by fostering a highly collaborative learning dynamic due to peer support, advice, and assistance.